Some finely crafted small books, despite the richness of their contents and the originality of their design, often pass unnoticed at the time of their publication. Most are selections of poetry produced on the margins of a mainstream literary milieu, independent of the commercial presses, and whose distribution is minimal and limited by comparison. Yet it is through these small presses that many poets, a majority of them in fact, see their work first published in an artful and attentive manner. 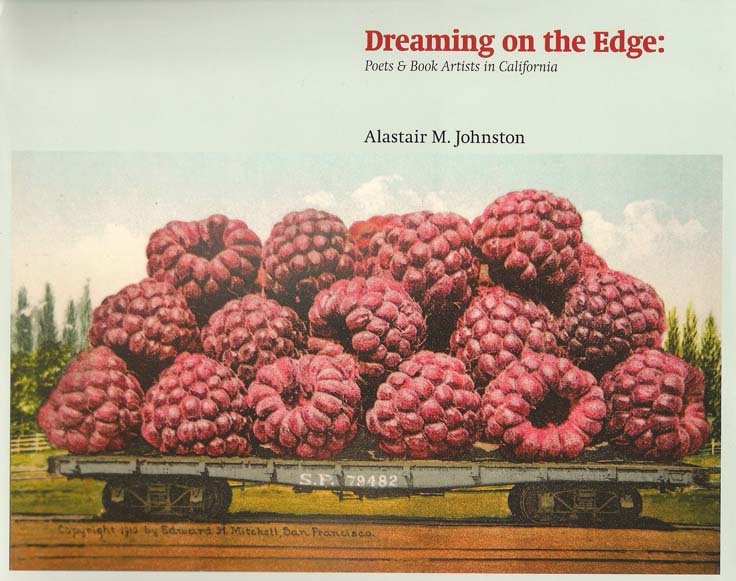 Alastair Johnston’s anecdotal history Dreaming On The Edge; Poets & Book Artists in California surveys small marginal presses peculiar to California from the late 19th century up to the near contemporaneous products of the early 21st century. In doing so he uncovers a unique cultural characteristic of the American West: a penchant for hyperbole and tall tales, put-ons and elaborate fakes, practical jokes and cheeky shams. As the cover reproduction of a turn of the century hand-colored California postcard depicting gargantuan raspberries (an appropriate enough visual pun) stacked on a flatbed railcar illustrates, this is indeed the land of exaggeration and outsized expectations. Dreaming On The Edge begins its chronology with the irreverent collaborations of Gelett Burgess and Porter Garnett, publishers of a literary magazine tellingly titled The Lark, whose antics and bohemian esthetic could be said to parallel pataphysician Jarry’s model of undermining the status quo and pricking the overinflated conventions of the late Victorian literary establishment. The titles published by these rustic intellects include A Gang of Hoodlum Miscreants (obviously a manifestation of a proto-punk aesthetic) in 1895, Le Petit Journal des Refusées (a nod to the Impressionist brouhaha occurring in the French capital of the late 1800’s), and Will Irwin’s Love Sonnets of a Hoodlum published in 1901 with the aid of the above mentioned Gelett Burgess who was undoubtedly the evil genius motivating these tongue-in-cheek literary capers. 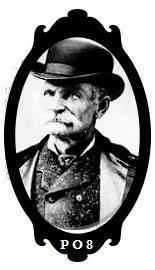 “Self-publishing is a key component of creative growth in California: from The Lark to the White Rabbit Press. . .artists have struggled to insert themselves into the discussion usually controlled by more mainstream media,” Johnston states in his Preface to this substantially illustrated assessment of 150 years of independent publishing in the Golden State. As the co-founder, with print artist Frances Butler, of the Berkeley-based Poltroon Press, Johnston brings a considerable and firsthand knowledge of small press publishing to bear on this fugitive aspect of artistic innovation in the print medium. The details of editions and fonts, the history and circumstance of their production, all are presented with a genealogic enthusiasm in tracing marginal relations and ephemeral idiosyncratic manifestations of the printer’s art. As the story unfolds, the incursion of technology affects the evolution of book arts and increases the potential for innovation in design. What once was a means of disseminating a variety of ideologies and avant-garde literary fashions became an end in itself, the artist’s book. The organizing principle behind Dreaming On The Edge, the edge being specifically California and its coastal regions, is that an artistic literary culture flourished unhampered by the overbearing constraints of the staid Eastern publishing establishment, and in this putative creative paradise anomalies and oddities thrived. What Johnston presents is the essence of diversity, a treasure map for the antiquarian, certainly, but also for those who are fascinated by edgy originality and innovation so often marginalized and unsung. The life span of many of these small press ventures was quite short, a mere blip on the cultural radar, and yet they persisted, spawning related efforts to publish the news that is always news, poetry, and from such radical and unlikely sources as Rexroth’s anarchists, pacifists of Patchen’s ilk, hippies, diggers, hipsters, beatniks and Buddhists. The author’s meticulous research into fin de siècle independent publishing sets the stage for the post-war explosion of repurposed letterpress printing combined with readily available modern reproduction methods as an extra-commercial means of disseminating current literature. “It has not been my aim to catalog the highlights of our famous authors,” Johnston says of the free works, parodies, and inspired concepts from the presses and fly by night publishing ventures he chose to feature. “In general I have ignored the author’s Collected Poems in favor of lesser known work because of connections it made at the time. Such work often had a larger impact than their normally limited circulation would imply.” This decision contributes to the inclusion of a wide variety of printed literature such as magazines, posters, broadsides, pictorial monographs, comic books, newsletters, and assorted guerrilla ephemera as examples of the diverse publishing activity occurring over the span of the historical era under consideration, and in particular the last 50 years or so, primarily in the San Francisco Bay Area although certainly not to the exclusion of the equally ingenious Los Angeles based artists, printers and publishers. The inclusive thoroughness with which Johnston has cataloged the players in this ink stained chronicle might have been daunting were it not for the anecdotal verve of much of its presentation. So one learns that a wannabe architect became an innovator in type and book design, or an employee at the SF Greyhound appropriated the equipment used to print bus schedules to publish some of the early work of Robert Duncan, Denise Levertov, and Jack Spicer. A cabal of conscientious objectors, among them William Everson aka Brother Antonius, interned in a camp in Oregon during the war liberated a mimeograph machine to promote and publish their pacifist poems and tracts, said example leading to the further utilization of this down and dirty DIY tech a decade later as the beginning of the mimeograph revolution in circulating works of literature. Another individual, Bern Porter, publisher of the literary magazine Circle was a nuclear physicist who had once worked on the Manhattan Project. And who knew that Ed Ruscha was the first artist to create his own textless reproductions of his work in book form? Johnston’s facts and related trivia provide a context in which to view the development of a book art culture unique to the West Coast. It helps that he was also a part of the thriving small press scene in the Bay Area, and interned at the West Coast Print Center in Berkeley. And as the publisher of Poltroon Press he has produced a number of monographs and essays on the art of printing. Poltroon Press is notable for having published Philip Whalen’s Diamond Noodle, and Zephyrus Image, a study of the collaborative efforts of printer Holbrook Teter and artist Michael Myer. 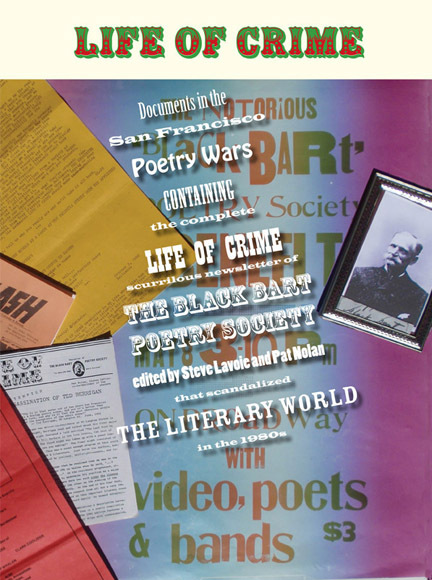 In 2010, Johnston also issued Life Of Crime, a compilation of all the scurrilous 80’s newsletters from the original Black Bart Poetry Society documenting its guerrilla war against Language poetry. In a section titled A Psychedelic Peyton Place, the author recalls his time working as a typographer at the Print Center and the relationship he forged as a book designer for various publishers and writers. 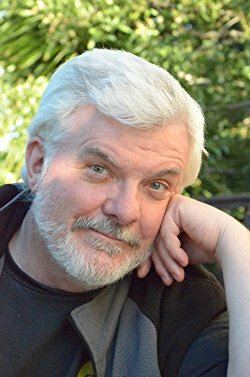 With salient detail as a series of snapshots he depicts the artistic, social, political tenor of the seventies and eighties in the Bay Area literary scene, and as well the shenanigans in the nearby artist’s hideaway of Bolinas, the psychedelic Peyton Place of the section’s title. There are also chapters referencing the Northwest poets, Snyder and Whalen, the Beats poets (West Coast style), as well as local literary figures, among them Joanne Kyger, Michael McClure, Richard Brautigan, and David Meltzer. However the real and perhaps most interesting subjects of this narrative are the printers, publishers, and printing art craftsmen and innovators including the likes of Dave Haselwood, Betsy Davids, Graham Mackintosh, Jaime Robles,Holbrook Teter, Frances Butler, Clifford Burke, and Johnston himself. Nevertheless the most illuminating development in small press printing and book arts is the attraction it has for women. Johnston highlights works from the Women’s Print Collective in Los Angeles beginning with the Women’s Movement of the 70’s as well as the work of women book artists in the Bay Area. “The Woman’s Movement flowed over into printing as letterpress” when that technology was deemed obsolete the author says in the closing remarks of the Preface. “Small presses picked up the tools and began producing their own work, using invention to compensate for technical shortcomings.” Scrapping the heavy machinery of linotype and letterpress printing for less labor intensive reproduction methods made available and more accessible the abandoned presses and disused type case inventories to a new segment of the creative population who were often self-taught with no previous experience in the mechanics of setting type. The repurposing of this antique tech for aesthetic aims offered ample opportunity for innovation and collaboration. The book and its process were viewed as artifact-in-itself as well as medium for a message. In the concluding chapters of Dreaming On The Edge, Johnston traces the progress of the printing arts through the efforts of a cohort of dedicated women artists in reviving a discarded technology and rescuing it from certain Schumpeterian creative destruction. Through the effort and example of artists and teachers like Betsy Davids, Jaime Robles, Frances Butler, and Kathy Walkup book arts are now an integral part of the arts curriculum at Mills College, California College of the Arts, and on a number of University of California campuses. The Pacific Center for Book Arts in San Francisco and the Woman’s Graphic Center in Southern California also encourage and foster the book arts with workshops, lectures, and annual prizes such as the Alastair Johnston Fine Press Award. Anecdotally, Les Ferriss, teaching the long running hands-on history of the book course at the Bancroft Library at UC Berkeley, reports the majority of the students in his popular class are female. As well, the significant presence of women in the field of book arts is evident in the print coop at Eric Johnson’s Iota Press in Sebastopol , California and its non-profit association, North Bay Letterpress Arts, with cross-discipline work done by poet and book artist judi goldberg and that of sculptor and book artist Brooke Holve to name just two of the many talented woman artists who make up the print arts collaborative. There is a particular appeal to the finesse of fashioning an object that is both delicate yet substantial, that speaks from its painstakingly arranged text as much as it does from its outward appearance, and in many cases its functionality as being entirely itself. The means of production for print expression has been ingeniously appropriated by writers and book designers inspired to redefine book aesthetics. The intricacy and detail of Johnston’s scholarship is such as it is difficult to summarize all of it in the limited space of a review. Not that there is too much information—there’s just enough to pique the curiosity of any red-blooded book hound, yet that’s still a lot. Fortunately, with a matter-of-fact familiarity, Johnston has accomplished an intimate personalized history of book as art, art as book. Dreaming On The Edge is available from the publisher, Oak Knoll Press. As it is a substantial reference on the books arts, and priced accordingly, this is a volume that would be well to suggest to the local library to add to their collection. This entry was posted in Poetry, Poetry Society and tagged Alastair Johnston, Betsy Davids, Black Bart, Brooke Holve, California, California Poetry, Clifford Burke, Dave Hazelwood, David Meltzer, Denise Levertov, Dreaming On The Edge, Ed Ruscha, Eric Johnson, Frances Butler, Gary Snyder, Graham Mackintosh, Holbrook Teter, Jack Spicer, Jaime Robles, Joanne Kyger, judi goldberg, Kathy Walkup, Kenneth Rexroth, Les Ferriss, Life Of Crime News Letter, Michael McClure, Modern Poetry, Oak Knoll Press, Philip Whalen, Poetry, Poetry Blogs, Poetry Lectures, Poetry Lessons, Poetry Society, Poetry Talks, Poets, Poltroon Press, Richard Brautigan, Robert Duncan, San Francisco, Schools of Poetry, The New Black Bart Poetry Society, William Everson. Bookmark the permalink.